Joe Today was not National Winter Tire Day in Sweden. That's celebrated on December 1 every year, and it isn't so much a holiday as it is the day when all cars in Sweden are required to have winter tires. That's not to be confused with Studded Tire Day (October 1), which s the earliest you can start using studded tires for the year. What's more, I don't own a car, so I'm not likely to celebrate either of these days in any particular fashion in the coming years. Today was, however, Winter Tire Day for me. The temperature over the last couple of days has dropped below freezing in what feels like a long term way, turning all of those muddy ruts in the forest path I take to school into frozen muddy ruts. What's more, it looks like there must have been some transitional precipitation last night, because this morning everything was covered in a sheen of ice. Tonight, the ice is covered in a light dusting of snow. In short, it's perfect bicycle weather. How will I cope with this awkward situation? Never fear, gentle reader, for I am now prepared to face the winter. Today I am the proud owner of a pair of Hakkapeliitta W240 studded bicycle tires. As you may have guessed by the name, they're manufactured by a Finnish company. In point of fact, they're made by Nokian, and if that sounds a lot like another Finnish company, well that's because they used to be the same thing. You see, back before the dawn of the 20th century there was a little wood pulp company in Tampere, Finland, which eventually moved to a nearby village which had access to better water power, the village of Nokia. From these humble roots the mighty Nokia Corporation sprung, the most famous rubber boot manufacturer in all of Scandinavia. Oh, and they make some cell phones, too. Actually, that cell phone thing seems to have worked out pretty well for them, cause in the 90s they sold off all their rubber subsidiaries. The boot company became Suomi Rubber, and the tire factory became Nokian. So now I feel like I have a little piece of Finnish history on my bicycle. 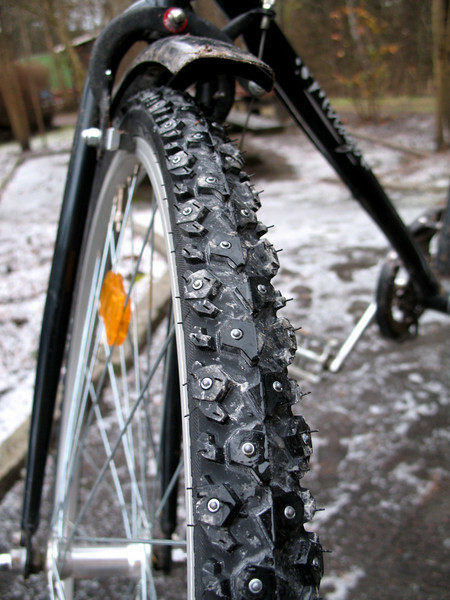 They're pretty sweet tires, too: handmade from ecologically friendly Finnish rubber, with carbide spikes for long wear. Now I just need a good pair of crampons and an ice axe.